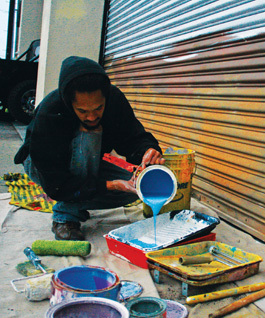 PAIN'T MISBEHAVIN': Elijah Pfotenhauer mixes paint for his latest project, a mural at Good Guys Biodiesel. CUSTOMERS coming into Santa Cruz Stoves & Fireplaces sounded alarm bells. "There's a kid outside the store with cans of paint," they told employees worriedly. "He looks like he's going to spray the walls!" Spray the walls is exactly what Elijah Pfotenhauer was intending to do. It was late 2006, and Pfotenhauer had already established himself as a talented Santa Cruz muralist with two other projects, one depicting dancers on the former Motion Pacific building on Front Street and another at the former Santa Cruz Teen Center on Laurel. The three-panel scene outside of Santa Cruz Stoves & Fireplaces would be his largest project to date. And some shoppers didn't know what to think of the young black man outside the store armed with spray paint and a vision. Nearly four years later, Pfotenhauer, 29, leans against the back of his truck across from the mural. Paint stains his jeans and the brown hoodie pulled over his head. He's willowy and speaks in a voice so soft you have to lean in to hear him over the traffic. It all started when the shop's owner, Steve Vorhees, commissioned Pfotenhauer to paint a bamboo-themed mural in his home. He'd seen Pfotenhauer's work, and the two men shared mutual acquaintances. While the two talked one day, Vorhees mentioned the Water Street building. "Oh, that place?" Pfotenhauer remembers saying. "That building has a crazy wall. I always wanted to tag it at night with 'Where's the mural?'" So Vorhees suggested painting his store first. He wanted a mural depicting Vulcan, the Roman blacksmith god of fire and volcanoes, and a modern-day family around the hearth: fire past and fire present. The third scene, a mechanical fire-breathing dragon, was all Pfotenhauer. "I took it as three time periods," he says, "ancient, modern and futuristic, with my own spin on heat." Lava flows through the Roman god's tunnels and turns to fire in the family's wood stove before moving through the vents surrounding the futuristic dragon. As with most—if not all—of Pfotenhauer's murals, symbols abound. "Fire as renewal," he says. A scarab and phoenix decorate the molten walls of the first scene. Framed pictures of a pinecone ("They need fire to spread their seeds. Fire destroys and fire renews. Nature has it all figured out"), a sunrise and Burning Man decorate the family room walls in the second scene. "Pictures within pictures," Pfotenhauer says. "It's cool to go into a space within a space." The dragon in the third scene snakes around in a figure 8—an infinity symbol—and flowers fall out of the vents. "It's futuristic and industrial," he says. "I feel passionately that for us to evolve, technology has to evolve with nature." Certain themes appear frequently in Pfotenhauer's art, among them the balance of nature and technology and our connection to both. Native people, plants and animals. Infinity symbols and the number 8. His website, www.paintedladder.com, and T-shirts show a boy painting a ladder, climbing it as he paints. "It means rising up creativity," Pfotenhauer says. "Turning metaphysical into physical. Art has the power to do that." It also has the power to turn a superhero-loving kid into a professional painter. Pfotenhauer's first gig as an artist was as a superhero. He posed for a drawing class at the California College of Arts and Crafts while iguanas crawled around the room. He wore his costume under his clothes, went into a closet and came out clad in a red cape and blue suit. "It was iguanas and a little black 5-year-old Superman," he says. At the time, his mother attended the Oakland school and Pfotenhauer frequently attended art classes and lectures with her, bouncing between Santa Cruz and the Bay Area as a kid. He liked to draw teenage mutant ninja turtles, stick figures killing each other and violent robots. After graduating from Santa Cruz High School in 1998, Pfotenhauer took classes for a couple years at Cabrillo before traveling across Europe, painting murals in exchange for places to sleep and do his laundry. "Paris, Barcelona, parts of Italy, Switzerland, Prague, Amsterdam, southern France. I painted in every country except for Italy. I toted spray paint in a shoe box outside my bag." Traveling, painting, taking classes and traveling some more became Pfotenhauer's routine for a half-dozen years. He studied animation at the California Institute of the Arts in Southern California between 2003 and 2005. "I was inspired by animation, its platform to be a lot of disciplines," he says. "It can incorporate storytelling, visual arts, music." When he was 25, he dropped out. "I wasn't feeling it," he says. "Was it school or me or just us? I felt really removed, isolated, which is an opportunity in itself if you're in the right state of mind. But it wasn't what I was looking for at the time." Again, he hopped on a plane and flew overseas, painting a teen-center mural in Vietnam and an underwater scene at a dive school in exchange for scuba lessons and certification in Thailand. Then he returned to Santa Cruz. Pfotenhauer's latest mural decorates pull-down doors outside of Good Guys Biodiesel on Water Street near Santa Cruz Stoves & Fireplaces and Charlie Hong Kong, where he recently finished a birds and vines mural inside the eatery. He also spends a lot of time with kids, volunteering at DeWitt Anderson School and Renaissance High School, where he's taught mural classes since 2007. A handful of kids at the high school help him paint murals on the weekends, and have supervised mural projects with youngsters at MacQuiddy Elementary and Rolling Hills Middle schools. "Santos, Shasta, Carlos and Pedro—they're the next generation of muralists I'm watching come up," he says. "Santos went up to Oakland with me to paint murals, and wrote the grant for the Books Not Bombs–sponsored mural [at Renaissance.]" But funding for arts programs at all schools—including DeWitt and Renaissance—has been cut to the quick, so Pfotenhauer's still looking into grants and other sources to pay for his time, art supplies and gas to and from both locations. He recently started a few new paid teaching gigs: art at Star High School on Frederick Street, beat making at Highlands Park Community School and set design at Happy Valley Elementary School. He's also offering private and small-group classes. "Elijah plays an essential but often underappreciated and under-resourced role," says Sandino Gomez, youth empowerment coordinator at the Resource Center for Nonviolence. "It's really unfortunate that art programs have been cut so thoroughly in schools. People like Elijah go above and beyond any official capacity or responsibility to bring art to kids." 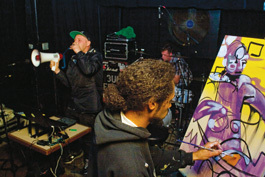 When Youth Coalition Santa Cruz teens said they wanted to paint a mural, Gomez asked Pfotenhauer to mentor the group. Together, they built a giant frame for one mural, learned to draw and paint, and even silkscreened T-shirts at Barrios Unidos for a second mural. Both now hang in the Santa Cruz Library. A "Bookscape" is upstairs (with help from Renaissance High teens) that shows a girl reading under a tree with leaves made from pages; below her, paper swells from a purple sea meet a town built of books. The youth group also completed an "Energy Conservation" 3-D mural that hangs above the downstairs computers. In it, people hang clothes to dry on a line out the window, and real T-shirts with energy-conservation images and messages hang on a real clothesline between the two canvases. "Elijah puts brushes in kids' hands," Gomez continues. "He puts paints in kids' hands, and he has them do it. He meets them where they are at, and gives them the encouragement they need to shine. "He sees the world as a giant playground-slash-canvas that we're just lucky enough to interact with." Pfotenhauer himself takes a democratic view of art. "Something I'm trying to articulate is how we're all artists," he says. "It'd be cool to not even use the word art, just to say 'life' or 'expression.' Expression is just another part of life. It's pretty valid. We all do it in different ways. The way I do it is a classic way." It's a Friday afternoon, and Pfotenhauer is the only male in the room. He's teaching an art class at DeWitt Anderson, an alternative school for girls ages 12 to 18. This is volunteer work—he used to get paid but now the money's run out—so twice a week, he drives to Freedom with art supplies to teach. Last year, he and the girls created a mural titled "Women We Admire in Art" featuring Kat Von D, French graffiti girl Fafi and Santa Cruz's own DJ Eko, among others. Today the girls are making dream pillows, ironing silkscreen images onto fabric and then stitching and stuffing. "It's a pillow that inspires you—you're going to look at it every night before you go to sleep," says Janelle Carranco, cutting out images of dancers to iron onto her pillow. "Mine is dance. I want to be a choreographer." Another girl chose a photo of the Bay Bridge at sunset; another picked an ultrasound image of her baby, due in a month. Pfotenhauer circles the desks, threading needles and giving advice. "He's a talented artist, an inspiring, creative leader with a big heart," says teacher Lissa Downey. "His style is really easy, really encouraging of the girls. He's gentle, and to have an experience with a young man who is so gentle is important to them. He's very real with them." "So after these pillows, what's our next project?" asks Jyzenia Maldonado. "I don't know," Pfotenhauer answers. "Let's figure it out together." For more information about Pfotenhauer's murals and private classes, visit www.paintedladder.com. To see more photos of Pfotenhauer at work, visit news.santacruz.com.